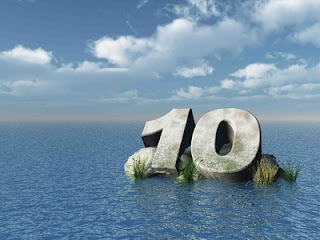 Today's post was prompted by a discussion on the accountants website, AccountingWeb. One accountant was looking for a simple way to manage client deadlines in Excel, for Corporation Tax returns, VAT Returns, Companies House Annual Returns, etc. Although this example is for accountants, it can be applied to managing any sets of multiple deadlines. Although there are all sorts of packages out there for doing this kind of thing - and I would suggest using those if your needs are much more complicated than this example - if kept simple, Excel might be all you need. I have provided a finished (simple) example but will talk you through how to build it. You can also filter the report by manager using the drop-down at the top. When you have completed a return, update the next due date for that return on the data sheet. When you refresh the pivot table again it will re-sort reflecting the change. The spreadsheet consists of a simple data sheet, applying my principles for laying out data and using protection and colour to make it obvious where data is to be entered. There are three deadline dates in the example, but the principles can be applied to s many as you want. There are also two calculated columns in the protected area (the protection has no password, so it can be switched off if you want to look at or edit these columns). As dates are stored in excel as numbers, the minimum of these three dates is also the earliest. Also note that the MIN function only applies to the numeric fields, so will ignore any cells that do not have a due date. The second calculated column (column J - Include) is used to exclude any blank rows from the data, as the MIN function will return zero (00/01/1900 in Excel date terms) on these rows, putting them at the top of the list as they are well overdue! This column simply uses the IF function to return an "N" if the Next Due Date is zero, otherwise a "Y". These two calculated columns have been copied down for 500 rows, but could easily be copied down further if you need more. The second sheet of the workbook is a Pivot Table, whose source is all of the columns of the Data Sheet. The pivot table has been created with the Manager and Include fields as Report Filters, and the client information as the rows. All subtotals have been switched off on the client information fields and the pivot table has been set to Classic Layout - this means that we can keep all of the client information on one row. 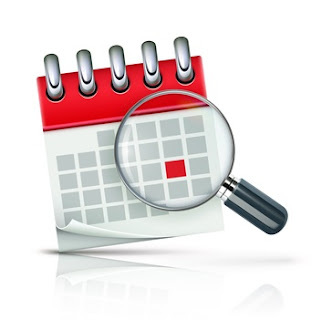 All of the dates have been set as Value fields, formatted as dates and set to summarise by Min. As there should only be one row per client, Sum, Average or Max would have done as well, however Min seems safer, as the point of the spreadsheet is our interest in the earliest date. 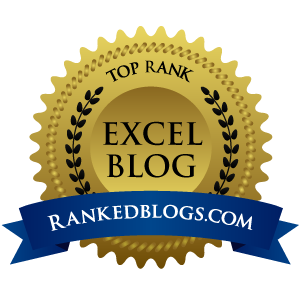 The most important change to the pivot table is the sort. By right-clicking on the Client Name field, selecting Sort -> More sort options, we can set the Client field to sort in order of the Next Due Date, ascending. This sort is what makes the report useful, as it shows the clients with the earliest Next due date at the top of the report. The only other changes made to the pivot table were to remove the column totals (they don't really make sense for dates), and to edit the headings for the value columns to make them more user friendly. Obviously, this is a simple example and much more complexity could be added, however this would have confused some simple principles. One of my ten principles last week was to protect cells with formulae in them, and it occurred to me that it might be useful to do a quick post on how cell protection works. It is really easy to use and very effective for ensuring that formulae don't get over-typed. 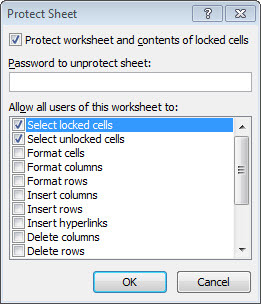 First of all we choose which cells we want to be locked, and then we switch protection on for that worksheet. We determine the protection status of a cell by selecting a cell, or cells, and choosing "Format Cells". This can be accessed from the right-click menu. By default, all cells have the Locked box ticked (as shown above). 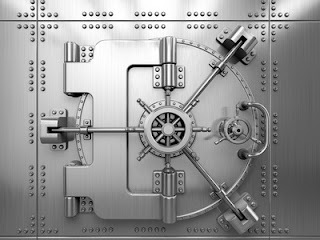 This means that the cell will be locked (and therefore can't be edited) if the sheet is protected (in the next stage). If we untick this box, then the cell, or cells, will remain free to edit, when protection is switched on. We will typically select the data entry cells and unlock them in this way, prior to switching protection on for the sheet. There is also a second tick box (Hidden) that allows you to hide the formula in the cell (again, only once protection is switched on). 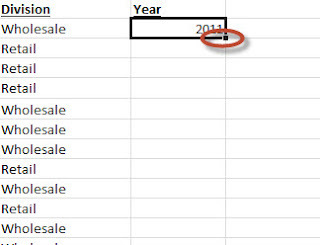 In Excel 2007 onwards select the Review ribbon and click Protect Sheet. 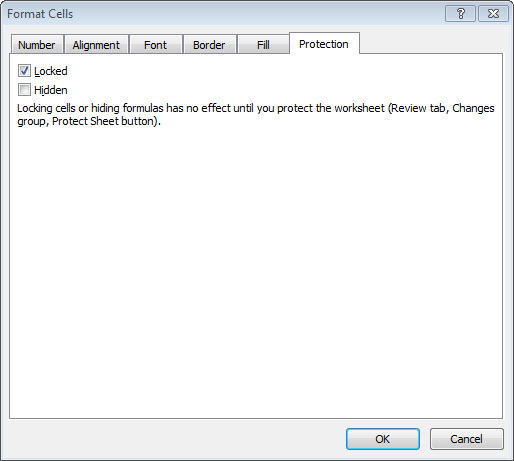 In earlier versions of Excel, select Tools->Protection->Protect Sheet. The top tick box will always be ticked (you can't click OK if it isn't). Under that, you can choose to enter a password that will be required to unprotect the sheet. You will be asked to enter this twice to avoid mistyping it. Below that is a list of tick boxes where you can allow things that would otherwise not be allowed on a protected sheet. By default, the first two are ticked, meaning that you are still allowed to select any cells (whether locked or unlocked). On a data entry screen, I often untick the top box, as this stops the user even clicking in cells that can't be edited - making it easier to navigate the sheet. Other tickboxes (further down the list) that you may want to tick, are such things as allowing the use of Autofilter, Sort, or Pivot Tables. This form gives quite a lot of control over what the user can or can't do. When you are happy with the above, click OK. 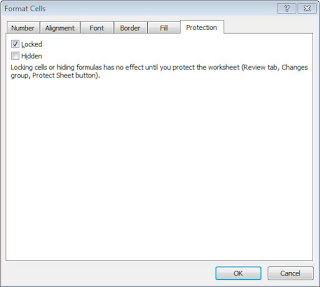 The protection settings will be applied to the active Worksheet. To unprotect the sheet again, go to the same place as you did to protect it. You will notice that the option now says Unprotect Sheet. When you click this, you will be asked for the password (if you applied one), and then the sheet will be unprotected again. If you then go to protect it again, the tick box options are remembered, however you will need to set the password again.